I’ve been teaching my three sons about money lately-working for it, saving, spending, etc. I’ve been using the Dave Ramsey Financial Peace Jr Kit to do it (You can read about my love for the Dave Ramsey methods here and here) and as part of that I’ve been showing them how my blog works as a job for me and how I earn money from it. My nine year old in particular was fascinated by how I can share ideas for free with my readers and earn money from the ad networks that you see in my sidebar and on some pictures. I explained to him that it was like watching TV and having commercials in a program. He’s made it his mission to come up with an idea for my blog in hopes of splitting the income. Today’s his big day because today’s Sloppy Joe Pockets are his idea! We have an agreement to split any money earned from today’s post 50/50 (his idea, I photographed and published it so it’s a profit share!) If you like it I’d love for you to leave him a comment! I can’t post anything about sloppy joes without sharing this video-anybody else remember this? Back to the recipe-I love sloppy joes but they’re, you know, messy! 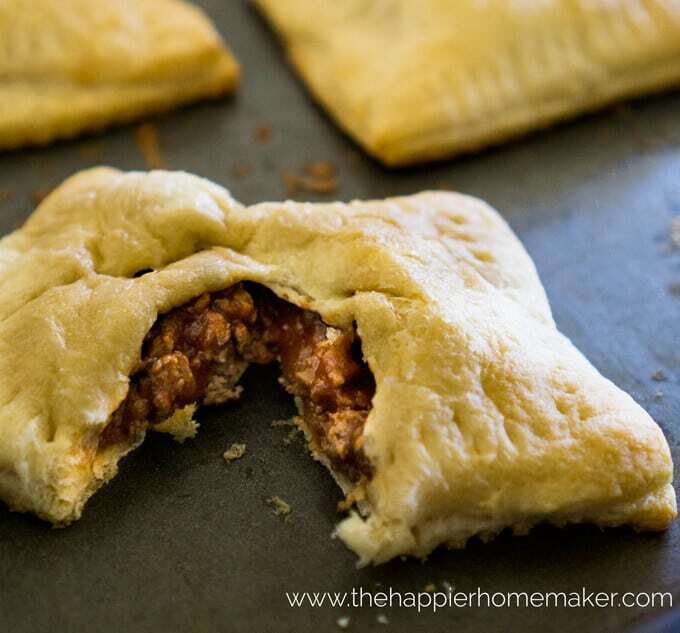 These pockets make them easy enough to eat that even my 4 year old can manage to eat them without us having to throw him in the bath afterwards! Brown beef and drain. 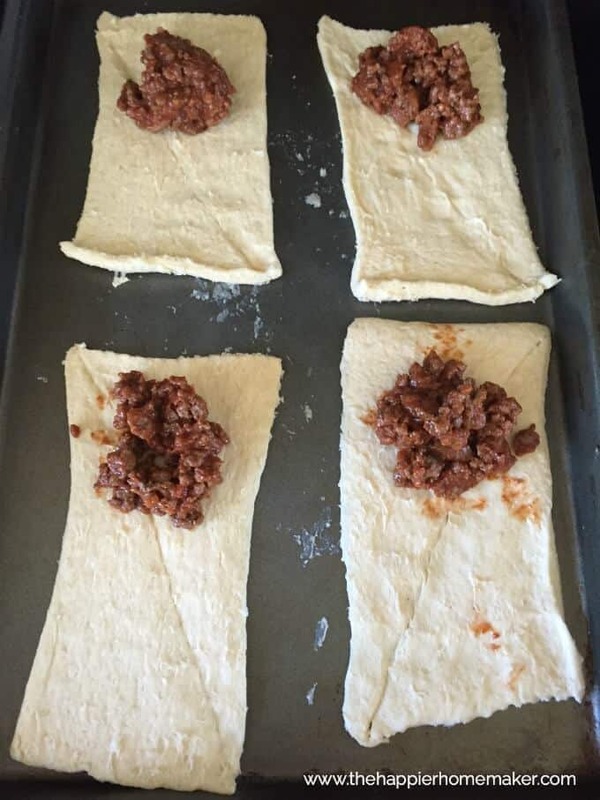 Add sloppy joe mix according to package directions, set aside. Preheat oven to 350 degrees. Roll out chilled crescent dough on a baking sheet. Separate into 8 rectangles-each comprised of 2 crescents. Use fingers to seal the perforation between the two crescents. Spoon about 1/4 cup sloppy joe mixture onto the dough as shown, being sure to leave ample edges to seal around meat. 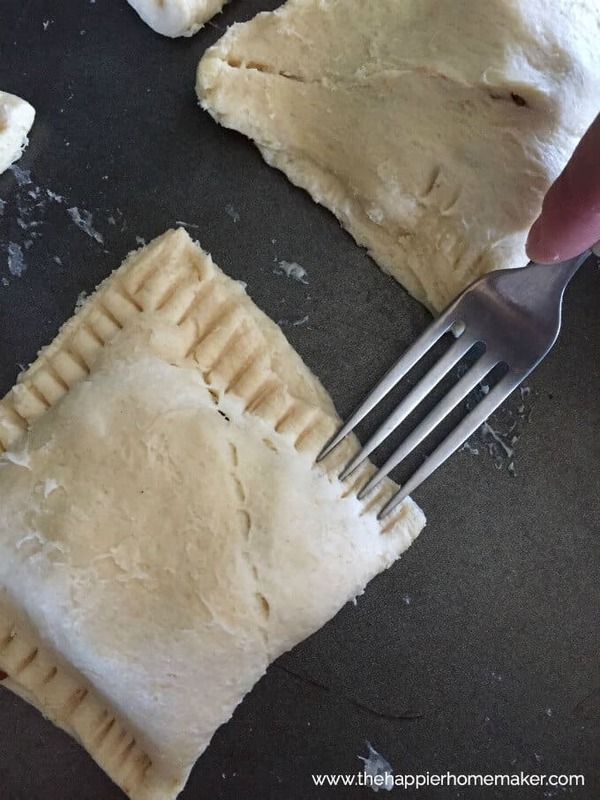 Fold the dough over the meat and use the tines of a fork to seal the edges. 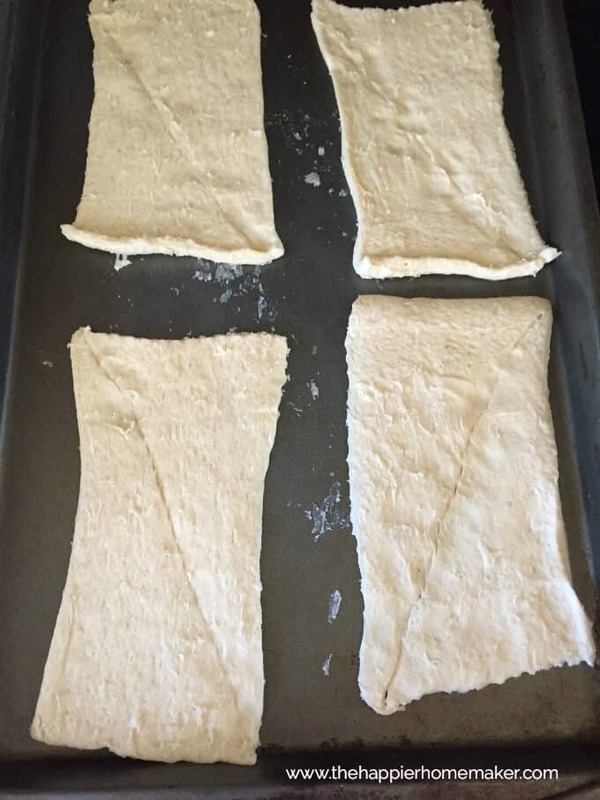 Bake for 10-12 minutes until golden brown. Serve immediately! So delicious, these are one of our go-to weekend lunches to make ever since we first tested the recipe! Thanks for reading and supporting my little budding entrepreneur!! These pockets sound nice. Thank you and have a Great Monday. Love this simple recipe! Easy enough for the kids to make too! Great idea! Throw together a salad and my hubs would like it too! Great quicky dinner idea. What a creative 9 year old!! My 23 year old son will love these! I will have to make them next time he visits. You never outgrow your love for sloppy joes. Thanks for sharing your great idea! These sound great and fairly easy to make ! Yum, we’ll be trying these this week! Thank you. Big hello to your little man. We have learned so much from listening to DR podcasts. ? Can’t wait to try these! Go Jack!! Hi Jack. 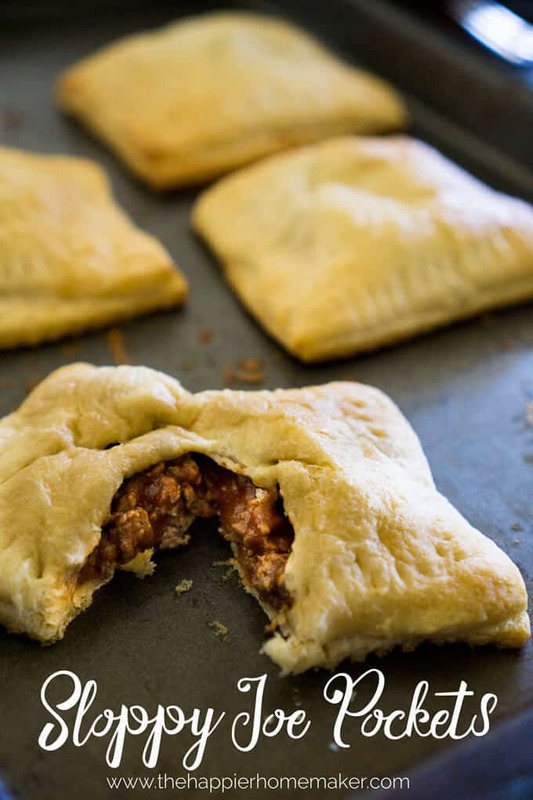 I got grandma to fix your sloppy Joe pockets for me and I love them. You did an awesome job with these buddy. You always surprise me with the things you do and I am proud to be your grandpa. Keep up the good work and I’ll be looking forward to your next recipe. I want to try this recipe today!! I love sloppy how’s but the “sloppy” not so much. Great post. As a new blogger myself, I’m kinda obsessed with reading other mommy/housewife/beauty blogs ; ) I would love to start making money also and I wished my parents taught me what you are teaching your sons about managing money! Great job, Momma!